Air Cadet Central is pleased to announce that .sqn.ac has been re-jigged and is ready to accept orders! A great service provided at fantastic value to Air Cadet Squadrons. .sqn.ac is a web service provided in conjunction with our parent company, Maia Internet Services, to bring the best web tools to the Air Cadet Community. 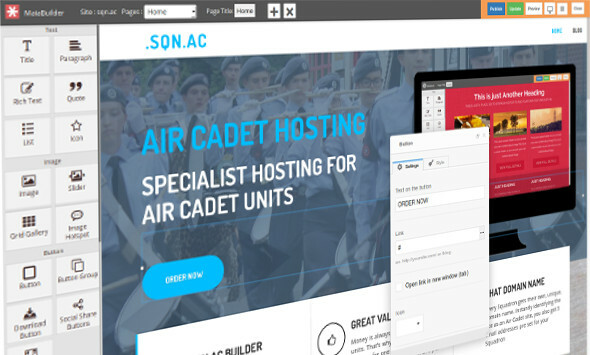 .sqn.ac is initially a webhost giving each Air Cadet Squadron a simple, easy to use interface and a unique domain name. Using the tools provided by Maia Internet each website can be built using the excellent Drag and Drop editor. Simply select one of over 260 themes, upload your images and text then arrange them as you wish. Hit the publish button and your site is live. Also, you get that unique domain name included. having a web address of 298.sqn.ac is simple, straight forward and easy to remember! right now you also get 5 email forwarders. You can hand out your great new email address – oc@2354.sqn.ac – and have the mail sent there to any inbox you wish. anything else for my hard earned cash? As we’re starting out from scratch again that’s the current line up. BUT, as we do more research and gather requests .sqn.ac will start to provide other services. Things such as collaboration tools, communication suites, social media integration… The list is endless of what we could provide, but we want to make it relevant and useful. As these services come online you will get access at no extra cost. fantastic – simply click here and fill in the form. We need to know your details including your Squadron Number, Full Address, and a contact phone number. We only accept applications from @aircadets.org email addresses and once we’ve verified that you’re a real Squadron we’ll set things up for you. Normally takes less than 24 hours. .sqn.ac is not here to make a profit, we’re here to help. Anything that you would like to see we’ll take a look and get it up and running!